As New Jersey state workers’ contracts approach their expiration date, their future—and the outlook for organized workers statewide—is on the line. The winds whipped and the heavens poured down rain, and through it all the union workers remained. In ponchos and hats, the 3,000 New Jersey laborers wielded signs featuring resolute fists and urging “solidarity!” They congregated outside the Trenton statehouse in February in support of their counterparts in Wisconsin, where public workers were clashing with the state’s governor over the right of collective bargaining. The New Jersey union members weren’t demonstrating only because the bonds of labor unions are forged in steel. Rather, they were compelled by an inescapable fact: the fight would arrive here next. While New Jersey still ranks among the most heavily unionized states in the nation, a national sea change has arrived here. Along with the rest of the country, New Jersey has seen its union numbers diminished in re­cent decades, dwindling by 23 percent since 1983. And now, New Jersey’s largest population of organized workers—state employees and teachers—face their biggest challenge yet, in the form of tough-talking Gov. Chris Christie, who has made re­form­ing benefits spending a top priority. State workers’ contracts expire in June, and the governor is taking the opportunity to draw a line in the sand on issues like health care and pensions. It’s the just the latest labor battle to be waged here. Cash-strapped Camden has already laid off half its police and firefighters, while Camden County gave pink slips to 260 county workers, including corrections officers and other union members. And, last fall, fruit giant Del Monte severed a 25-year relationship with the Broadway Terminal in Camden to tap cheaper labor at the non-union Gloucester City Marine Terminal, costing 200 longshoremen their jobs. With so many forces eroding the power of unions in the Garden State, some are beginning to wonder: is there anything left to fight for—or is the decline of organized labor inevitable? Sweeney’s own plan for reform—via proposed legislation—would up workers’ health care contributions to between 12 and 30 percent of their premiums, based on a sliding scale. It would also transform the pension system. Propelling this effort is Gov. Christie, who has made no secret of the fact that he sees unburdening New Jersey of its union obligations as essential to reducing its debt burden. Christie wants state workers to pay for 8.5 percent of their pensions as well as up to 30 percent of their health care premiums, the latter increase taking place over the span of four years. (State workers currently pay 1.5 percent of their salaries into their pensions, and contribute about 8 percent of the cost of premiums.) Benefit cuts, a higher retirement age and the elimination of cost-of-living adjustments for pension recipients are all on Christie’s agenda as well. The annual savings could be anywhere from $200 million to $900 million depending on who’s doing the counting. But Christie’s attitude toward the unions practically makes Sweeney look like he’s soft-pedaling. The vitriol started even before Christie took office, and since then he’s clashed with the New Jersey Education Association (NJEA), the state’s teachers’ union, over everything from pay freezes to teacher evaluations to test scores. He elevated the acrimony even further in April, when he called the teachers’ union leaders “political thugs” during a nationally televised interview. Why has it come to this? Proponents of reform argue that the state workers are protecting their benefits while ignoring the current economic realities. The no­tion of public workers and teachers as fat cats seems incongruous for many, but it serves as the foundation of Christie’s argument. The state unions, meanwhile, believe that Christie has unfairly targeted them. Says NJEA?spokesman Steve Wollmer, “He wants to demonize and blame public employees for something they had no control over”—the global financial crisis—while extending tax breaks to the wealthy. And, union advocates note that the state has not contributed to public pension funds in over a decade. It wasn’t always that way for organized labor. 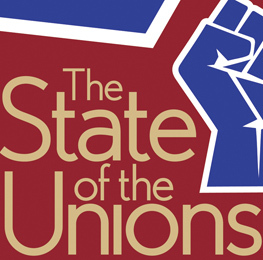 Five decades ago, one in every three American workers was in a union. Now, the number hovers around 12.5 percent—17.1 percent in New Jersey. How did it get to that point? Organized labor brought into practice a slew of workplace safeguards—minimum wage, the federal Occupation Safety and Health Or­ga­nization, the development of human resources standards—that minimized wor­k­place hazards and discrimination, oftentimes obviating the need for unions themselves. Blame the changing nature of the economy, too. As manufacturing jobs were shipped overseas and service jobs took their place, the unions failed to seize the opportunity. As well, in New Jersey especially, unions suffer from a bit of a public relations problem, with a reputation for bloated bureaucracy, outsized political influence, mob connections and corruption. A recent Pew Research poll found that only 45 percent of U.S. adults have a positive view of organized labor, near the lowest level in 25 years. To their credit, the unions have taken it all in stride. “We’re down from years ago, but 17 percent [of New Jersey workers belonging to a union] is still a significant number,” Wowkanech says. “I mean, we represent nearly a million workers. There’s no other umbrella organization in the state that can say that.” The union influence is still significantly felt. For example, look at the organization of 4,500 casino dealers in Atlantic City, the result of a three-year-long push by labor advocates after a quarter-century without union representation. Or, consider the New Jersey AFL-CIO’s efforts to encourage its own members to run for office, with 639 election victories to its credit. The unions may be workers’ most vocal mouthpiece, but will that voice die out? And yet, despite all that, many point to the scene last fall at the Broadway Terminal in Camden as the ultimate illustration of the potency of the anti-union corporate impulse. Labor organizers say they bent over backwards to accommodate Del Monte, in order to convince the produce giant to remain at the port. “We met their demands,” which included a $5 million concession, says Martin Mascuilli, secretary-treasurer for ILA Local 1291. “We couldn’t have done any more than what we did.” Even after turning a $144 million profit at the port in 2009, Del Monte moved on. Significantly, workers were also failed by the traditional union tool of the picket line. They stopped work at the Camden terminal, not to mention every container terminal in the Port of New York and New Jersey, (through an act of support by New York and North Jersey members of the International Longshoremen’s Association). But the outcome was un­changed. Still, solidarity within and between union organizations remains a primary trump card for labor groups. That’s why a battle over the right to collective bargaining in New Jersey, like the one in Wisconsin in February, would draw both private and public sector union members to the front lines. The implication is that if the government workers bend on some issues, then the union model will live on. Stand too rigidly, and well, the whole thing might snap. Whatever happens when new state worker contracts are drawn up, it will lay the groundwork for the future of organized labor in New Jersey.